Amritsar: A tragic train accident here on Friday took a political turn with the Opposition accusing the state's Congress government for lapses in allowing celebrations near railway tracks and Punjab minister Navjot Sidhu's wife facing allegations of leaving the site soon after the incident. Navjot Kaur Sidhu, who was the chief guest at the event, later talked to media at a hospital where injured were taken and said her priority was to ensure they receive proper treatment. "The effigy of Ravana was burnt and I had just left the site when the incident happened. Priority should be to get the injured treated," she said. She also asked people to refrain from politicising the issue. Union minister and Akali Dal leader Harsimrat Kaur Badal said the entire onus was on the state government. "There are not enough words to mourn the Amritsar train tragedy that claims so many innocent lives. My deepest condolences to the families who lost their loved ones. The incident needs to be probed as it casts serious question on administration," she tweeted. BJP leader and Union Finance Minister Arun Jaitley said the initial reports suggest it was a tragedy that could have been avoided. Another Akali leader Bikram Majithia said he was distressed to hear the unfortunate news of the train accident. "The authorities concerned must be held accountable for the ill-fated accident & strict action must be taken against the guilty police officers and organisers," he said. Some opposition leaders also alleged that the Dussehra was organised by the Congress near the tracks without receiving any proper approval. Former chief minister Parkash Singh Badal demanded an inquiry by a retired high court judge to fix responsibility and punish the guilty. His son and senior party leader Sukhbir Singh Badal said he was extremely sad to hear the unfortunate incident. "Local organisers and police must answer how the celebrations were allowed to be held near the railway track," he said on Twitter. At least 52 people were killed and 72 injured Friday evening after a crowd of Dussehra revellers that had spilled onto railway tracks while watching burning of Ravana effigy was run over by a train near here, officials said. The train was en route to Amritsar from Jalandhar when the incident occurred at Joda Phatak where at least 300 people were watching 'Ravana dahan' at a ground near the tracks. 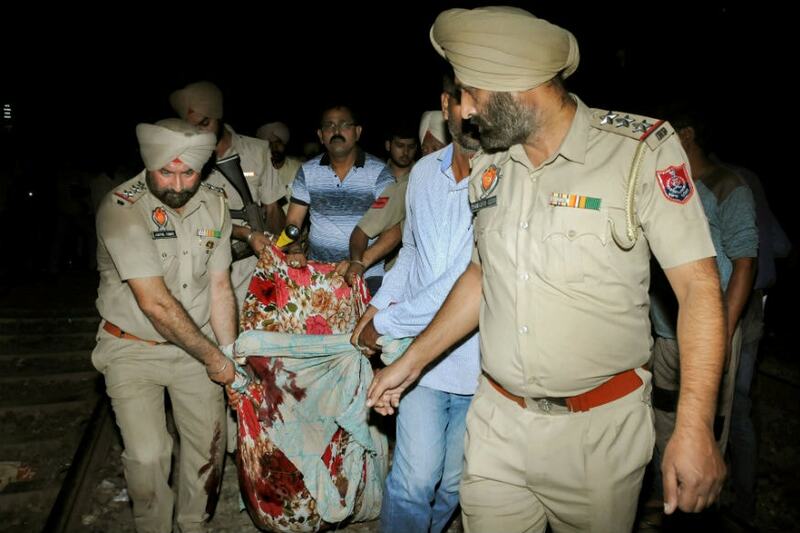 Sub Divisional Magistrate Amritsar I Rajesh Sharma said 52 people have died and at least 72 injured have been admitted to Amritsar hospital. All major parties including the BJP, the Congress and the AAP said they have asked their respective local party workers to help in relief and rescue operation.